Join BostonCAN this Friday at 6pm outside Senator Kerry’s Cambridge St. office for a candlelight vigil in solidarity with those at home and internationally who are already bearing the brunt of the last century of treating the sky as an open sewer. The vigil will be the largest Boston-area event to call attention to the Copenhagen climate summit. We need to continue to push Senator Kerry for effective and equitable climate legislation at home and treaties internationally. Here’s a roundup of some good reading on Copenhagen, but first I want to recommend Mike Tidwell’s great op-ed in the Washington Post. Mike calls us to do more strategic organizing focused on the scale of change we need. While I don’t think it’s useful to undermine people’s personal efforts to cut their own carbon emissions, I agree that climate activists need to always push their constituencies to do as much on the political level as they do on the personal level. And while there is danger is comparing any movement to another, Mike employs the precedent of the Civil Rights Movement well in this context. 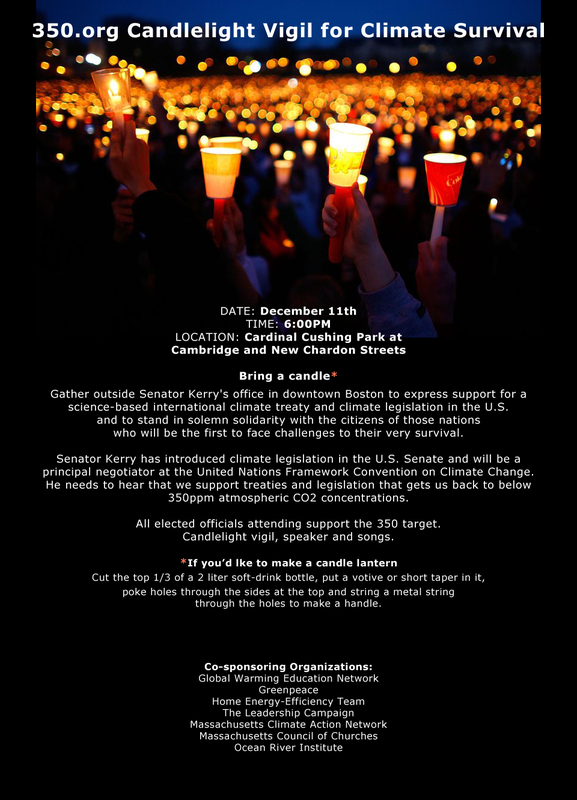 Another nudge to join the vigil outside Senator Kerry’s office this Friday! Another great editorial, written by Guardian editors, was published today in 56 prominent newspapers around the world. Many, like the Guardian, put it on their front page. We need something like this from the Globe instead of the infuriating “balanced” offering they printed today. Their coverage of Copenhagen was admirably spread from world news, to local and business. We won’t win the climate battle without all hands on deck. The movement has to be strong in middle-class neighborhoods and it also has to be strong in poorer communities too. Given that poorer people, and people of color in particular, have gotten the short end of the stick over the last century of high carbon exploitation, the climate movement should be doing everything it can to tap our passion for justice to kick this fight into high gear. Previous Article Coming Up: a Global Warming Cafe!